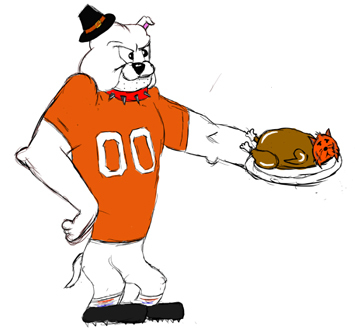 An Artesia Bulldog serves up a roast Tiger in this drawing by Artesia High School junior Maegan Lemon. The ‘Dogs will host Los Lunas at 1 p.m. Saturday at Bulldog Bowl in a Class 5A State Semifinal game. On the rare occasion teams find themselves squaring off in the playoffs with an opponent they defeated during the regular season, it can sometimes be difficult to prevent overconfidence. That’s not a major problem in Artesia, where the Bulldogs tend to respect all squads on their loaded schedule. But as was the case last week against an Alamogordo club that took a 12-0 lead over the ‘Dogs in the first quarter of the teams’ Oct. 7 meeting, there’s a key stat heading into Saturday’s Class 5A state semifinal that keeps Artesia from looking past a Los Lunas team they topped 39-21 Sept. 30. The boys in orange dominated the opening quarters against the previously unbeaten Tigers at Bulldog Bowl, taking a 33-7 lead in at the half. But whether a bit of complacence crept in or a few breakdowns in the fundamentals surfaced, the Bulldogs were outscored 14-7 in the second half of play. “We’ve tried to make that a big part of our thought process this week – that we need to expect the Los Lunas that we played in the second half to be the team we’re going to play here Saturday,” head coach Rex Henderson said today. “We know Los Lunas is a good team, and we’ve visited with our kids a lot about that second half. The ‘Dogs outgained the Tigers in terms of total yardage 454-303 Sept. 30, passing for 336 of those yards while Los Lunas ground out 236 on the turf. Tiger RB O’maury Samuels is committed to Michigan for a reason; that he’s going to gain yards is a given. But the Orange Crush defense was able to hold him largely in check in the first half. The senior finished with 172 yards on 26 carries against Artesia, with 47 of those coming on a single third-quarter touchdown. Samuels also returned a kickoff 96 yards for a score with two minutes left in the game. Sophomore quarterback Nicholas Gaerlan didn’t take to the air often but completed six of 15 passes for 67 yards and one touchdown while rushing 12 times for 34 yards, and backs Noah Gum, Hunter Wisneski and Jacob Luna also contributed in bits and pieces to the Tigers’ offensive performance. “It was kind of hard to evaluate Los Lunas after they played us, because they lost their quarterback and running back right after us against Belen,” Henderson said. “They played St. Pius the week after that and got beat pretty bad (44-7), and then they beat the other teams in their district, which aren’t very strong, pretty bad. The Tigers got their revenge for a 22-21 loss Oct. 14 to the Eagles with a 16-14 edging of Belen in the quarterfinal round, coming back from a 7-3 halftime deficit to score 13 unanswered second-half points while forcing a trio of Eagle fumbles. One of those fumbles was recovered by Samuels, who did double duty in the contest as RB and LB, also scoring the Tigers’ go-ahead TD in the third. Los Lunas also pulled a number of tricks out of their hat against the Eagles, including a rare usage of the “bounce rooski” and a punt fake in the final moments. “They showed a lot of creativity and imagination with some of their offensive and kicking game plays,” Henderson said. “So we’re going to need to be ready for some things that will probably be different from what we saw before, which was pretty standard football in which they just ran their system. The week of Thanksgiving can often be a disruption to the preparation routine, but the ‘Dogs have kept their work ethic at a high following their 56-29 win over Alamogordo last week. Henderson says the team has had a solid string of workouts and look to be well-focused on their ultimate goal. “We feel real good about what our players have done this week,” said the coach. “We were really pleased with the focus and the intensity that we got last week, and I think if we’ll come back with that same energy they went after last week’s game with, we’ll be in good shape.